I love Diary of a wimpy kid because Jeff Kinney makes it seem like your with Greg the whole time. this does not have all the pages!And i have this book. THIS BOOKKKKKK ITS SO AMAZING!!!!!!!!!!!!!!!!!!!!!!!! Okay, this book is really cool for sure My favorite character is Greg If anyone hadn’t read this i recommend you to read this its super duper awesome!!!!! Wow! I loved it! It made me laugh out loud when I read the comic bit. Have you watched the films? Well, i have! I loved this book because it was funny and I like diary of a wimpy kid series a lot. I loved the part where they were about to do the test on the states and Greg was sitting right next to a map with the states in big red writing and then Patty Farrrell puts up her hand and tells the teacher that they should cover up the states map and Greg fails the test. I like the part where his mom forces him to be in the play and he really doesn’t want to participate in it. But when he watches the movie and finds out that Patty Farrell is auditioning for Dorothy he wants to be a tree so he can throw apples at her. But when he gets his costume he realises that they don’t have any arm holes so he can’t throw the apples at Dorothy ( Patty Farrell ). Then one of the other trees trips over the bush and can’t save himself because hi arms are stuck under the costume. So the teacher says that they can have arm holes and Greg is in for a bit of luck. The night of the play is hilarious because Greg won’t sing the song that they are supposed to sing and he doesn’t sing it and he sees Dorothy ( Patty Farrell ) behind the curtain and Greg starts throwing apples at her even Toto the dog joins in they are my favourite parts of Diary Of A Wimpy Kid. This story book was little bit boring.😳. Because i think this was the 1st book. But all the other series r very IMPRESSIVE!!!!!! When I was in Year 5 I saw some boys in my class reading the books and I wanted to read them. I started reading them and I really enjoyed it. It was funny and I liked the drawings. I have seen all three movies and they are good as well. If you have never heard of this series of books read them, they are really good. Its really funny. I have it. great book! its really funny its one of those books that just cant get boring! This book is epic it is the best ever. It is a brilliant book I think I would recommend it to some people because there are lots of funny part’s like were Greg and the 2 other trees + todo start battering patty with apples and how cheese touch would not go away. I think we should thank Jeff kinney with all his amazing books because my 2 sisters mum and dad really love the book if I could choose it would take me forever me everyone in my family and class love it! I hope my review and please tell every one about diary of a wimpy kid.I have read and got all of them including diary of a wimpy kid the long haul haul! This book was brilliant, the first Diary of a wimpy kid book I read. I liked the frist chapter and it gave you lots of information about the book it’s a great book to read and also funny. This book is great and funny.It shows how life is for a wimpy boy and makes your funny bones wear out! LOL!!!!!!!! this book was so funny that I couldn’t even read one page without laughing. you should read this because you’ll get a shock of how great and funny it is. Diary of a Wimpy Kid is a very good book. I have read the whole series and watched all the movies and my favourite is the 1st book. i think this book is really good but i didn’t actually laugh ?? I remember purchasing this book, at first i was dreading the thought about buying this due to the fact i wasn’t into humorous books, Once i read it i bought the whole series.For people who are not sure about this book, no need to worry as this book is quite amusing and appropriate. The only word I can use for this book is, AWESOME! This is a marvellous read. A perfect story to set off such an awesome series! If you enjoyed it then you will love the movie that goes with it! A good read for girls and boys! The illustrations are amazing and the book is funny. Absolutely funny. Most middle school students including myself can relate to this. I love it and it ls hillarios,and funny & I laghed my pjamas off!!! The 1st of a series of Laugh Out Loud books. I like Rowley as I think he’s so funny! I thought this book is the best of the Diary of a Wimpy kid books. It has everything that a book should have. I defiantly recommend this book it’s great. Really recommend this book to everyone! It is so funny and entertaining, you would be asking for more. This is the first book of the series and really funny because you can identify with Greg. Great! I love wimpy kid. WOw so funny, so clever, so… GREAT!! It’s so funny. I read it twice. 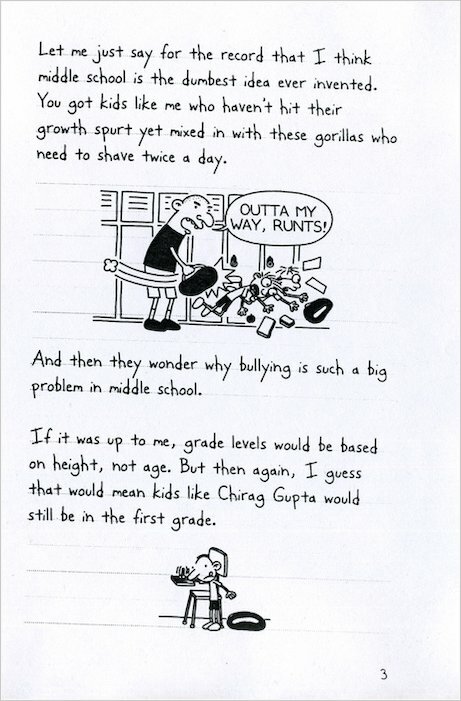 This is the first ever book book in the seiries about Greg trying to fit in in middle school. Diary of a Wimpy Kid, is simply an amazing book! funny and interesting i love it so much !! This book is all about a wimpy boy called Greg. He may be a little mean, even to his best friend Rowley, but without him, this book would be the worst ever read. This book is so funny that I nearly fell off my bed laughing! Love DOAWK! 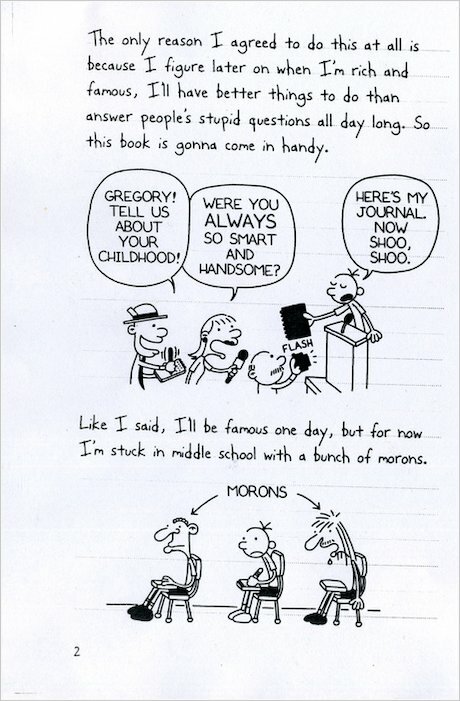 So funny and relatable, even if Greg is a jerk to Rowley! Hilarious. A great easy-going holiday book. I loved it. it was really funny. ha. I love this book! It is hilarious, and a great book. I also love the movie! If you like this book you should try the other 7 books! So far Jeff Kinney has done a great job writing these books. 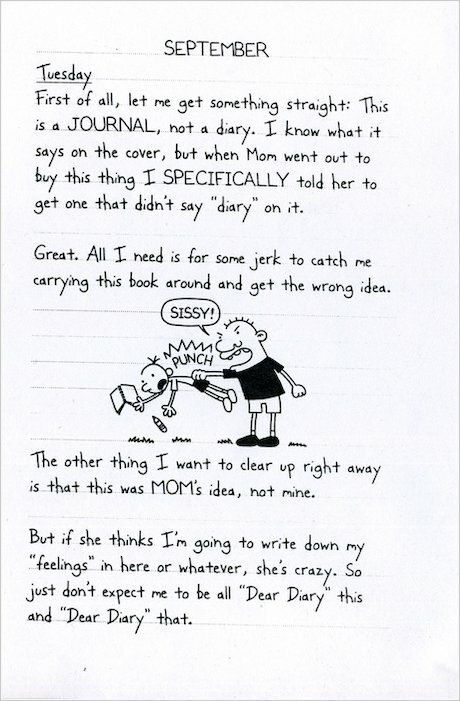 I hope he makes more Diary of a Wimpy Kid books, or another funny book series. Also, if you like this book series, I recommend Dork Diaries. Dork Diaries is like a Diary of a Wimpy kid, but a girl version. very funny and manny is very cute!! it is a really funny book. 5/5 i recommend it, the other books in the series and also the films! I love this book i read it last year. I love the way that the diary is laid out. funny, had me in tears with laughter! This is the first book of the ‘Diary Of A Wimpy kid’ series. When i read this i literally could not put it down! it was hysterical and will get you in to fits! This book is about Greg Heffley starts 6th grade, and his attempt to become the most popular kid in school goes downhill. he thinks his problem is his best friend Rowly, but an unexpected accident makes rowly popular! so what should greg do? I rate this 5 stars!! The first one was ok,but as it continued it got way better. I found this a bit boring. The best of laughs, I`ts a real page turner!! 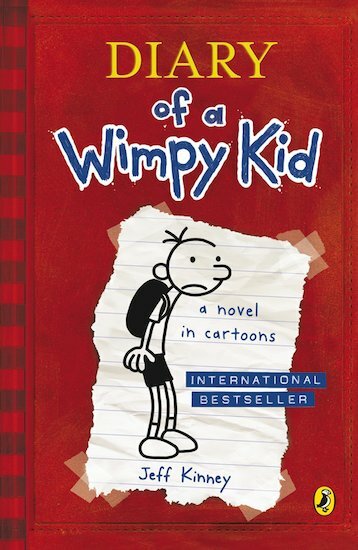 !This is the first book in the diary of a wimpy kid series and believe me you would`nt regret reading this 10/10!!! I HAVE READ THIS AND IT IS REDICULUSLY FUNNY. This book is very funny, and I would recomende to everyone. A fantastic first Diary of a Wimpy Kid book 5/5!!!!!!!! I loved this book!!! I have read all the Wimpy kid Books ( Thanks to my school Library)! 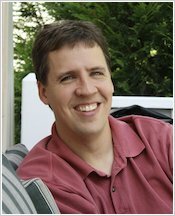 I think jeff kinney is an amazing author! And I LOVE Greg Heffley! THIS IS A AMAZING BOOK.GREG IS REALLYFUNNY. Great Book. Cant wait to read the rest of the series. very funny, but the only wimpy kid I’ve read.I’m hoping to read the other ones soon! This book is very funny! i cant afford the books and i really want to read them! this book is really funny and has lots of jokes this book is for someone who likes a lot of humour! the first of the series and so it is amazing! I loved this book. I think it started a craze so I can’t speak a word of bad stuff about it! It’s the funniest book I’ve ever read! I could read it a thousand times and still laugh at the jokes. I love how cartoons are involved as well. very good book ,very detailed and better than the film!! Hilarious, once I picked this book up I couldn’t put it down, literaly; I walked home from school reading it non-stop. I really liked this book. It caught my attention from the very first sentence. It is So unbelievably funny I couldn’t believe it. How Jeff Kinney the author think them up I don’t know. I would recommend this book to anyone over 8 years old. I would rate it 5 stars! this book is all about a wimp at school and i found it great fun to read. after i went to the movies to see it with my friends and i cant wait to read the rest of the series. This book was a great starter to the series, gregg starts secondry school abd life gets tough! Will gregg survive older boys ad girls at his new school? I rate this book 5/5 Jeff Kinney is a great diary writer! This is a great first book and got me reading all of the other books in The Diary Of The Wimpy Kid range. This is a really good book.And I would love to read the rest of the set. (even though nearly all the books are in our school. )I decided to read this book because our teacher (or princaple. )told us to do a review on a book that we read,and a lot of the studants picked a review on the diary of a wimpy kid so that what maked me decide.The weirdest part was when the teenagers made Rowley eat the rotten cheese from the year before, which started the cheese touch up all over again.I would give this book a 10 out of 10!!! Great beginning to the series and funny like when he talked about morons in his class. I love it. I’ve read it 3 times. FUNNY!! This book is the first of Diary of a wimpy kid and is hilarious! i think this is a very funny book. i finished it in 2 days! One of the best books I have read.Greg is really funny. Can be bossy to friend Rowley. always had good ideas. Mean to little brother manny. Hates older brother Rodrick. Hates parents. Thinks family is absoulutly irretating. Amazing!! You must read this book. I thought this book was going to be boring and girlish as it said “Diary” in the title of it but no!! It was not girlish,it’s for boys and girls. But I would have to say more boyish but it still is for boys and girls. I have read this book at least 1 million times!! It fantastic. I think this book is for 9 year olds to 14 year olds. The other books in the series such as The last straw,Dog Days and The ugly truth would be from 10 to 14 but maybe the ugly truth would be to 15 maybe. I really wish to see more wimpy kid books in the future! At first I thought this book would be too boyish for me but my brother let me borrow his copy and I loved it. The illustrations are great and the story was hilarious! its really funny and a easy read. I went to the library to get Diary of a Wimpy Kid after I heard people talk about it, I loved it! To begin with it started with “first of all, let me get something straight: this is a JOURNEL, not a dairy” which told me from the start this wasn’t a normal book. The attitude is something I liked best. I liked the illustration because it was like a comic and the way the pictures go with the writing which was used though out the great book. I read this book on a 2.5 hour car journey – it was THAT good. When I read this book I suddenly wanted all the others so made my dad buy me two: Last Straw and Dog Days. The reason why I loved Diary of a Wimpy Kid so much is it had great humour like the part where they played cheese touch. It’s like tag but you say ‘cheese touch’. It’s not as funny as in the book when I type it. It was funny because the way they put the sentences like a real diary but with a tinge of humour and sarcasm rolled into one. There is something that everyone can laugh at. Even my dad laughed at it when I read parts to him. There are loads of quotes like “that’s how I ended up in the emergency room two weeks later with a pink Barbie shoe stuck up my nose”. It made me feel silly, funny and weird. I enjoyed reading about his days and what he got up to. I can’t say anything that I didn’t like about book because the whole book was brilliant! Some days were funnier than others though. I think the age group is 8 and up. My dad laughed at the parts I told him to read. It is for girls and boys! I really enjoyed reading this book and found it funny and interesting. It seemed to be quite similar to my personal life and i know how he feels completely. This book is realistic and very funny. diary of a wimpy kid is very funny. greg hefley has a very strange life. This book is fantastic the whole series is great read this book and see if u like it and if you do read thwhole series!!!!! the most funny book I have every read… yet! The diary of a wimpy kid series is amazingly funny. With a mixture of words and picture- cartoons this is a must read. Also if you`ve seen the movie and thought it was class then the book is 50 times better. P.S. Try not to get the cheese touch. Greg has just started middle school and he thinks its the worst idea in the world. Greg and his best friend Rowley are not very popular in his school but they do there best to try fit in and don’t do a very good job of it. Join Greg in his first year of middle school in this Hilarious book! I love this book! It is sooo funny! i think this book is really funny from eating lunch on a potty and getting the CHEESE TOUCH! IT IS REALLY THE SAME AS THE MOVIE BECAUSE SOME BOOKS AND MOVIES AREN’T THE SAME. This book is sooo funny, i absolutely love the series, everyone’s gotta read them! This absolute sensational book is a hilarious novel for all ages. I loved this funny book because Jeff Kinney introduces silly, made-up personalities which will make kids laugh out loud! it’s really good book i recommend it. Honestly, I didnt love the book. For me it was quite bland and boring. Also it didnt really improve anything like vocab and ect. So for me it wasn’t amazing. But dont get me wrong this book could be good for you.I would suqqest it to people who dont really read, then this book will be great for them. i think this book is halarious!!!!!!!! all i can say is that if you’re a geek you shouldn’t be reading this book.I’m SERIOUS! i loved it try the rest!!!!!!!!!!!! I have just finished reading this amazing book. I haven’t put it down. It is a fantastic book and I would recommend it any day. The story is about a boy named Greg Heffley who is writing a journal on request of his mother. He has a great life (not). His brother Manny gets all the attention and his brother Rodrick is a bully. Greg’s best friend is called Rowley Jefferson and he doesn’t really fit in. They have a great time being friends. They play video games every night, every year they try to build the world’s biggest snowman (unsuccessfully) and at Halloween they even built a haunted house in Rowley’s basement. But when Greg chases little kids with a stick with a worm on the end, it looks like it was Rowley and Rowley gets the blame. Greg doesn’t admit is was him. 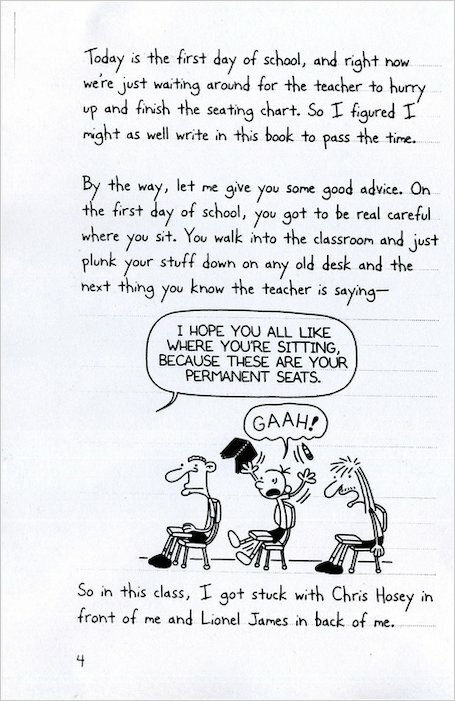 Greg tells Rowley, but the next day, Rowley has ratted him in. Will they become friends again or will they remain ex-friends? I love this book because it has more than one thing happening. Trust me, it is a fabulous book. i abousolotly loved it i feel sorry for Rowley because he ate the cheese! I loved this book because it is funny and what you will amagine it to be like. It is really funny!!! you have to read it’s pure comedy. I love this book because it is funny and it is like someone is actually speaking to you. i thought this book was really good and that is was based on real things that could actualy happen to you. Really good, although I have to say, you can eaisly read it in one day, as it is quite a spread out book. it is really funny, and I think it’s a lot of fun! I reccomend it to everyone! I thourghly enjoyed this book and I would recomend this to all other readers. I like this book. Personally, I wouldn’t call it the best book I’ve ever read, as I read it in one day, but it’s good for a funny, light and quick read. The cartoon strip are funny and easy to understand, though the plot line is not particularly complex. The plot is really quite simple, though the simple-ness created an atmosphere in the book that makes it a worthwhile read. I would recommend it, as it is very cleverly written, with humour and wit. Though make sure you read a proper book after. I want to read this!!!!!!!!!!!! One of my fav books ever! I would recommend it for boys and girls, it has lots of good advise and was really funny all through! Fab book, I want to read the whole collection! This book is quite funny, especially the bits about Manny. It isn’t in English though, its in American. I would reccomend this book, but not for a girl. Collect the WHOLE set! it is so cooooooooooooooool i am so geting more recomend to all of you!!!!!!!!!!!!!!!!!!!!!!!!!!!!!!!!!!!!! It was great, I loved the part where he made a haunted house! I think this book is great.I have read heaps of books and of all this is one of my favourites.It is a great read with mixtures of fun and excitment.I had a great time reading this book and it was soo good that I was very very excited when I went into whsmiths one day and saw the second one! I think that lots of other people would enjoy reading this too so you should definately get this.I give this book a 1000/10 and I hope this review has helped. this is the best book i have ever read.I am reading it agian which is probobly the fourth time i have read it.It is amazing,funny,sarcky and don’t forget great so people who haven’t read it your gonna have to cuz it is the best book in the world!!!!!!!!!!!!!!!!!!!!!!!!!!!!!!!!!!!!!! Diary of a Wimpy Kid is L.O.L.! :) There’s even a sequal! But anyways a LOT of kids in my class want to read to read it. It’s the story about Greg in his adventures in school and at home. I TOTALLY think you should read it. After reading the previews it looks really intreasting so i think i mite read the reast of the book.